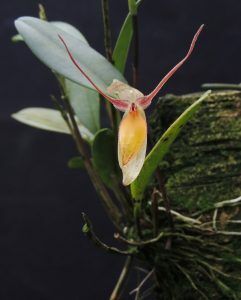 Another new Pleurothallis for 365 days is this rather odd species found from Colombia and Venzuela down to Peru. It is a small growing plant (the leaves and stems are currently 10cm long in total) that produces infrequent large solitary large flowers – this one is 4cm across and 5cm from top to bottom. The name means half-red pleurothallis but our plant has hardly any red and its colouring is rather more reminiscent of a poached egg! The plant is found in wet forest from 500-2100m and so it is at home in Cool Americas and it will be interesting to see how it develops into a specimen. A plant with many flowers our at once would be quite a sight. Thanks Mark – That is really helpful.